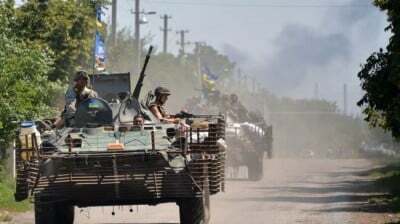 These units, like the 95th Airmobile Brigade depicted above, have been engaging in exercises which seem calculated for their PR effect – no exercise goes without a requisite and lengthy TV report which, incidentally, gives an idea of how these units are equipped. Interestingly, the mobile brigades seem to be using mainly T-80 MBTs taken out of storage, rather than T-64BV, Bulat, or Oplot is really indicative of the dire situation within UAF’s tank forces. The use of the gas-turbine powered T-80 seems to be motivated by the fact that there aren’t enough fully operational T-64BV left–that tank fleet has been heavily worn down by the last year and a half of fighting and frontline deployment. While the T-80 is an even more maintenance-intensive tank than the T-64, those tanks have not yet been ground down.